The first time that Skull & Roses was brought to my attention was on the Miami Dice review where Tom gave it a small recommendation and Sam totally vomited on it. That was a good thing because my tastes usually lean towards Tom’s ( except for Euros ) and never matches that of Sam’s. So that was a sign that I might actually like the game. But alas, the skull pictures were too much for me and thus I never bothered to hunt down a copy. I don’t really fancy playing games with skull pictures all over the joint. Eric didn’t mind the skulls and – to my surprise – he bought the latest English version ( now known as Skull ). 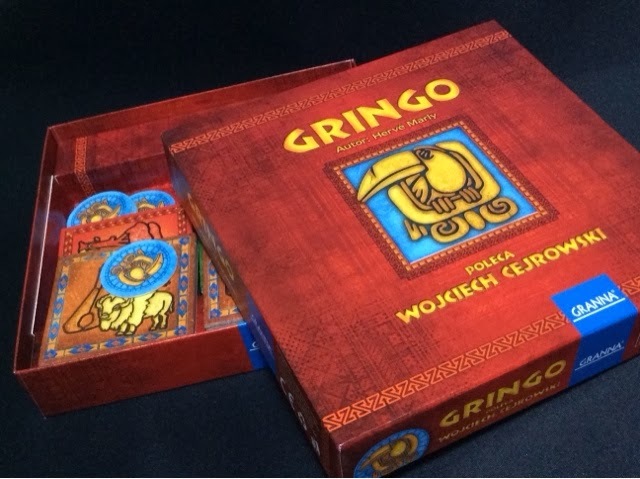 We gave it a go, and well, seeing that I am reviewing the Polish version named Gringo, I guess you should have a hint that I liked it enough to buy myself a copy. 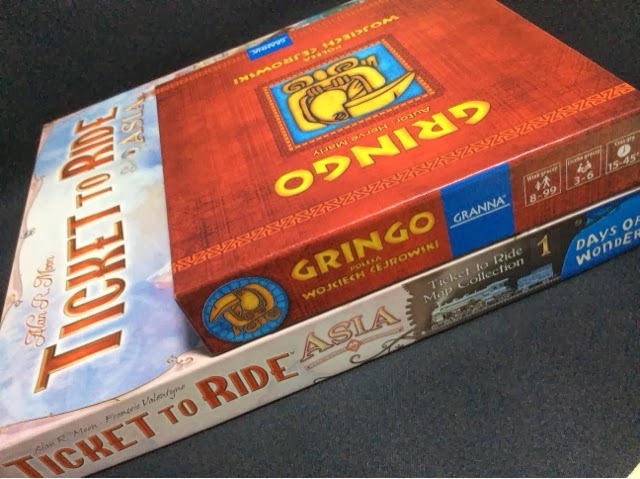 In Gringo, each player is a traveler who is setting out to explore as many countries as possible before the year is over. That’s the best one line description I can give for this nondescript game. Haha. Each player starts the game with 4 coasters. 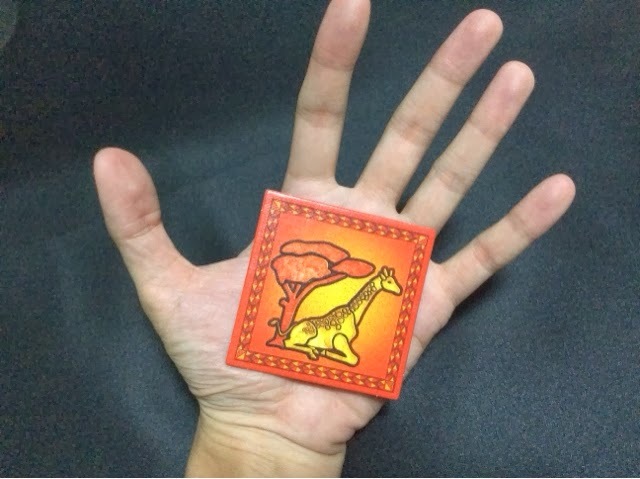 The top faces of the coasters depict a picture of an animal of a particular country. 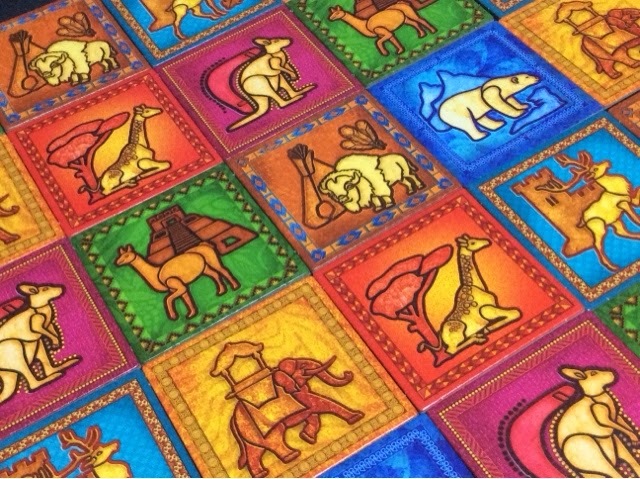 This is what is used to represent each player; basically, something like choosing your animal instead of your color. 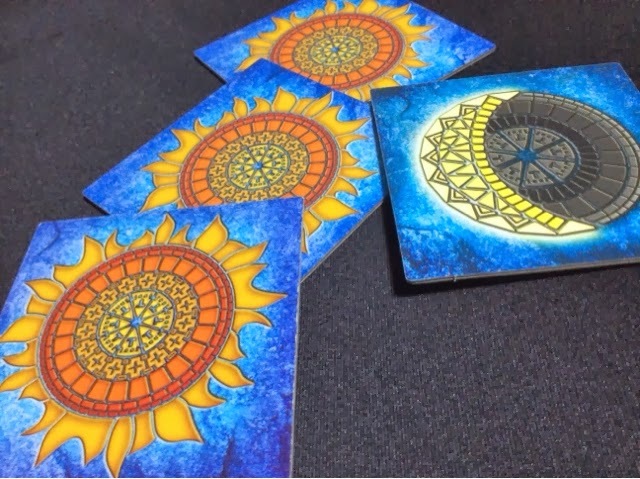 The bottom faces of the coasters are represented by 3 suns and 1 crescent moon. This is the important information for the game. The game is played in rounds till one player has successfully won 2 rounds or if one player is the only one left standing; that player is the winner of the game. Each round is played thusly. Players start with one coaster face-down in front of them. Starting with the start player, that player may either add another coaster face-down on top of the coaster in front of him/her, or, that player may bet how many suns he/she can flip over. If the player chooses to place another coaster face-down, then the next player has the same 2 options. If the player chooses to make a bet, then the round goes into the betting phase where the rest of the players may only choose to pass or to up the bet. Once passed, that player is out for the round and this continues till one player is left with the high bet. That player will have to flip coasters representing suns equal to the bet called. If the player is able to do so, then he/she has won one round, if he/she fails, then a penalty ensues. The important thing to note is that the player with the high bet always has to flip over the coasters in front of him/her first, before he/she can choose to open those of the others. So if he/she has tried to bluff the others and placed a crescent moon as one of their facedown coasters, and that player got stuck with the high bet, then he/she will definitely lose the round due to their own carelessness. The penalty for losing a bet is that you will lose 1 of your 4 coasters. If you lost it due to your own coasters having the crescent moon, then you may choose which coaster you will discard. If you lost due to flipping over a crescent moon from another player, then that player will randomly select one coaster for you to discard. When a player has discarded all 4 coasters, he/she is out of the game. If any player is left with 1 coaster, those players may only make a bet whenever it is their turn as they no longer have the option to add another face-down coaster. There are many bluffing games out there that use bluffing as a big part of the game, but generally, those games also involve some form of luck ( card draws, etc ). But for Gringo, it is a pure no luck bluffing game. You choose which coaster you place in front of you, and you choose which coasters to open. Win or lose is based on your ability to bluff and read the bluffs of the other players. There is so much satisfaction when you declare the highest bet possible and make everyone open all their coasters to find them bright suns staring out at you. Now, the art in Gringo is definitely something I can get into. Skull & Roses’s art was horrid ( in my opinion ), but when I saw an alternative version with such lovely art, I knew I had to make it mine. I love animals ! All sorts. So the combination of animals and art was a sure hit in my heart. Everytime I play this game, and I see the art of each coaster, I feel like I hit the jackpot finding this version in the wild. 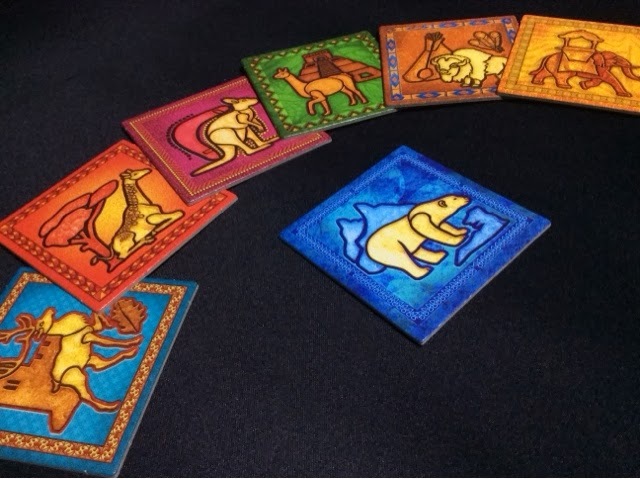 Gringo plays from 3-6 players, and can even play up to 7 with the Polar Bear expansion. Normally, most games that say it plays to 6 don’t really play very well due to the increase in gametime and downtime. However, with regards to Gringo, playing 6 ( or even 7 ) doesn’t really make the game much longer nor does it increase downtime. In fact, Gringo is the type of game that plays better with more people rather than less. The opportunity to bluff and bet high increases and this can lead to very different experiences each round. Some rounds you may have a wealth of suns to choose from, but in others, when everyone thinks the same, a small bet may not even find its way home. Simply Beautiful Art... Who wants to be House Baratheon ? Anyone ? Gringo is a very straightforward bluffing game. Anyone will be able to grasp how to play it almost immediately. But that doesn’t mean that the game is a one trick pony. The game feels infinitely replayable as the gameplay revolves around how the players react and try to outbluff each other. Some games you might want to be a gambler and keep shooting high, other games you can lay low and wait out for others to get eliminated. But most of the time its all about how well you can read the minds of the others around and how the groupthink starts to form as the game goes on. People you thought were risk adverse are now the ones who are jumping in head first. Each game has been different for me and I never ever felt like I have a strategy or tactic that I use to perfection time and again. Gringo is indeed simple to learn. But when it comes down to how to play it, sometimes you will need the right players to bring out the fun. I had a friend who asked me, “so if I put the crescent moon in front of me, then I shouldn’t be making bets on how many suns I can flip because I will certainly lose right ?”. If I weren’t the gentleman I am, I would have smacked her at the back of her head. This is a BLUFFING game ! Yes you will lose if you end up with the high bet, but you still bet sometimes because you want to make others think you don’t have a crescent moon and blah blah blah. Some things shouldn’t have to be said but you might want to spell it out so people can experience the game the way it is meant to be played. I managed to play 2 fantastic bluffing games towards the end of 2013 ( and start of 2014 ). I did a review of one of them called Dungeon of Mandom where I said that it’s in my top 5 of bluffing games. Well, Gringo is up there with it; also easily in my list of top 5 bluffing games. I won’t tell you which I prefer over the other ( that’s for another day ), but I will say that Gringo is possibly the best no luck pure bluffing game I have played in a long time ( maybe ever ). Each round plays similar to the next, but the dynamics changes and the players keep building on what has happened before to create a fantastic new experience each time. The act of flipping a coaster may seem like just an act to you, but when you made the high bet, and you know that a win is glorious victory ( or halfway towards glorious victory ), then the act of choosing the right coaster becomes a matter of grave importance to you. When your bet is high, each correct sun brings a gleam into your eyes and the subsequent win is magnificent in the making, or the epic fail will stir up rounds of laughter at your audaciousness and complete improbability of winning. In short, Gringo does what it intended to do very well. It is seamless, always interesting, and incredibly fun. I kid you not.